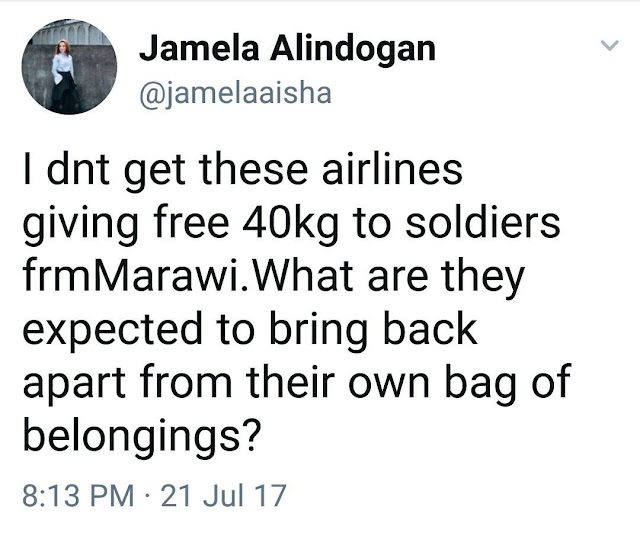 Al Jazeera correspondent Jamela Alindogan took to Twitter her confusion about the recent move of AirAsia to give Filipino soldiers additional perks when they fly with them. This came after a story of how passengers gave their extra baggage allowance to 3 soldiers heading to Marawi went viral. The recent move, according to the budget airline, is to show their gratitude to what the soldiers do for the country. As expected, nationalistic netizens was irked by Alindogan's insensitive remarks. Prominent social media influencer Sass Rogando Sasot countered Alindogan. You see, soldier's backpacks are heavy. Hindi uso ang travel lite sa mga sundalong sasabak sa isang operasyon. But it's not really the baggage allowance per se that matters here but the gesture of our airlines to give something back to our soldiers who are sacrificing their lives so that we could have a secure country. Kung iyang bunganga at kaartehan mo eh makakapuksa ng terorismo, we will also lobby for airlines to waive your baggage fee. FYI, US Airlines give free baggage service to US military personnels whatever the purpose of their travel. Sasot wrote on her Facebook page. Be a Krizette Laureta Chu, who raised a scholarship fund for the families of our fallen soldiers, in a world full of AlJazeera reporter Jamela Alindogan who is clueless why airlines gave our soldiers free baggage service. Sasot added on another post. What do you think of Jamela Alindogan's remarks? Do you think it's appropriate?